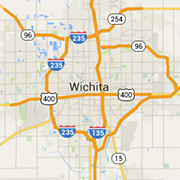 Browse Wichita Hotels, Motels, Inns and Bed and Breakfasts. Take a tour and make a Hotel reservation online. Find meeting rooms, banquet halls, wedding reception facilities, convention facilities and more. For leisure or business, Wichita's best hotels. Boutique hotel in the heart of Wichita with 103 rooms, 12 one-bed suites, over 50 shops, restaurants, theaters and nightspots in the entertainment district. Wichita's downtown boutique hotel has 88 recently remodeled stylish suites for brief, or extended stay starting at $99. Amazing rates, amenities, central location and style.